Map showing location of Serthar county in China's Sichuan province. A massive blaze has destroyed around 100 houses of nuns studying at a prominent Buddhist academy in a Tibetan area of China’s Sichuan province, according to sources in the region. The cause of the fire at the Larung Gar Buddhist Academy in Kardze (in Chinese, Ganzi) prefecture’s Serthar (in Chinese, Seda) county has not been ascertained, with some sources saying it could have been triggered by a butter lamp in a nun’s residence or by a faulty power line. Two nuns were slightly injured in the sprawling inferno, which broke out in the evening on Thursday, lighting up the night sky, the sources said. 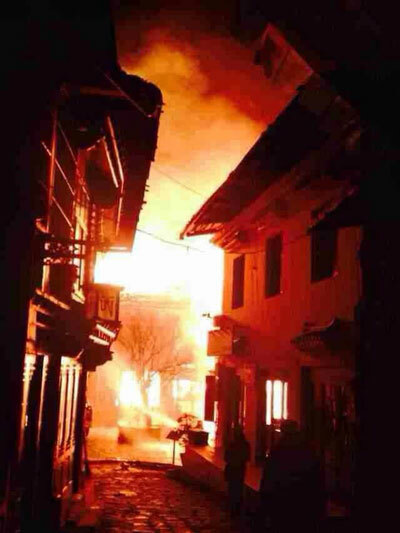 “On Jan. 9, a major fire burnt out several houses of nuns at the Larung Gar Buddhist Academy around 8:00 p.m.,” a Tibetan from the area told RFA’s Tibetan Service. “The fire started in a nun’s residence and burnt down about 100 residences located on the back side of the main prayer hall for the nuns,” the source said. Chinese media reports said that more than 450 rescuers, police, and firefighters took part in relief efforts and that an investigation was under way. “Efforts to put out the fire had no result. 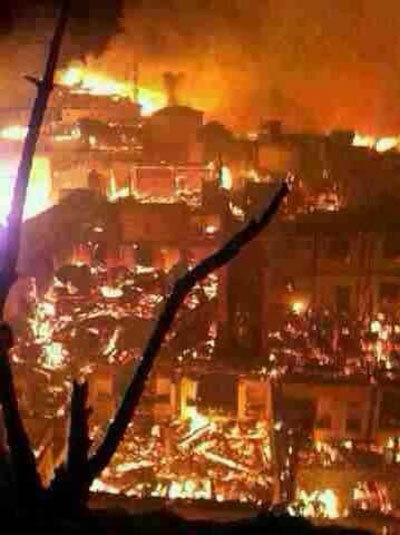 The glow of fire was seen throughout the whole Larung valley,” a second source said. “Only two nuns were slightly hurt in the fire and they were taken to Serthar county hospital,” the source said. The source said that the fire had burned uncontrolled for some 11 hours before it was finally extinguished. “Now the area burnt in the fire has been cleaned by several thousand monks and nuns,” the source said, adding that academy officials had issued a statement assuring the community that the residences would be rebuilt. Thousands of Tibetans and Chinese study at the Larung Gar Academy, which comprises a sprawling settlement resting between two adjacent hills in the Tibetan area of Kham, located more than 4,000 meters (13,000 feet) above sea level and hundreds of miles from the nearest city. The institute was founded in 1980, following China’s turbulent Cultural Revolution, by the late religious teacher Khenpo Jigme Phuntsog and is one of the world’s largest and most important centers of Tibetan Buddhism. It is now home to tens of thousands of monks, nuns, and other students, who make their homes in little wooden structures surrounding the main complex. Khenpo Jigme Phuntsok, who died in 2004, deftly balanced relations between the institute, Chinese authorities, and Tibetan’s exiled spiritual leader the Dalai Lama, whom Beijing has labeled a separatist. But in 2001, more than 1,000 dwellings at the academy were demolished by Chinese work teams and hundreds of monks and nuns expelled in what was widely viewed as an attempt to undermine Buddhist practice there. Police demanded that nuns sign documents denouncing the Dalai Lama and pledging not to return, overseas Tibetan groups have said, and the institute’s founder was detained for a year. In 2012, Chinese troops fired on a crowd of peaceful protesters in nearby Serthar town, killing one Tibetan man. The protesters had been calling on area residents to forgo annual New Year celebrations in favor of a mourning period to remember Tibetans killed during a crackdown in 2008. Official Chinese media said the incident had been triggered when “rioters” attacked police with knives and guns. Reported by RFA’s Tibetan Service. Translated Karma Dorjee. Written in English by Joshua Lipes.